The Mars Climate Sounder instrument on NASA's Mars Reconnaissance Orbiter maps the vertical distribution of temperatures, dust, water vapor and ice clouds in the Martian atmosphere as the orbiter flies a near-polar orbit. A new instrument on the joint NASA-ESA ExoMars Trace Gas Orbiter will make new Mars atmosphere maps. Aninstrument on one of the next missions to Mars is expected to beam back dailymaps of the Martian atmosphere from orbit and seek out gaseous clues in theongoing search for any evidence of life on the Red Planet. ? TheExoMars Climate Sounder will measure pole-to-pole, vertical distributions oftemperature, dust, water vapor and ice clouds in the Martian atmosphere. Theinstrument is one of five that have been selected for the ExoMars Trace GasOrbiter mission ? a joint European-American operation, scheduled for 2016, that will seek faint gaseous signaturesof potential life on Mars. Theatmospheric maps from the ExoMars Climate Sounder will provide daily profilesof the atmosphere's changing structure. Theinternational team of NASA and European Space Agency researchers building thenew Mars orbiter has two main goals in addition to interpreting trace-gas detections. Oneis to extend the climate mapping record that is currently coming from a similarinstrument on NASA's Mars Reconnaissance Orbiter. 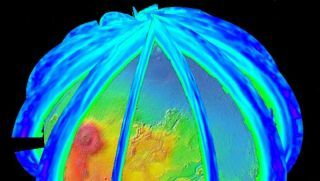 That instrument, called theMars Climate Sounder, has been working at the Red Planet since 2006. Theorbit of the Mars Reconnaissance Orbiter mission enables it to recordatmospheric profiles only at about 3 p.m. and 3 a.m. during the Martian day,except near the poles. The ExoMars Trace Gas Orbiter, however, will fly an orbital pattern that allows thespacecraft to collect data at all times of the day, and at all latitudes. "We'llfill in information about variability at different times of day, and we'll addto the number of Mars years for understanding year-to-year variability," saidTim Schofield, principal investigator for the ExoMars Climate Sounder at NASA'sJet Propulsion Laboratory in Pasadena, Calif., in a statement. "The mostobvious year-to-year change is that some years have global dust storms andothers don't. We'd like to learn whether there's anything predictive foranticipating the big dust storms, and what makes them so variable from year toyear." Anotherresearch goal is to provide information about the variable density of theatmosphere that could assist future landings on Mars. At any chosen landingsite, atmospheric density has a tendency to change from one day to the next,which can greatly affect a spacecraft's descent. "Wewant to provide background climatology for what to expect at a given site, in agiven season, for a particular time of day, and also nearly real-timeinformation for the atmospheric structure in the days leading up to the landingof a spacecraft launched after 2016," Schofield said. TheExoMars Climate Sounder is an infrared radiometer designed to operatecontinuously, day and night, from the spacecraft's orbit at about 250 miles(400 km) above the Martian surface. Theflexible instrument can pivot to point downward or toward the horizon,measuring temperature, water vapor, dust and ices for each 3-mile (5-km)increment in height throughout the atmosphere from ground level to 56 miles (90km) in altitude. TheEuropean Space Agency and NASA have selected five instruments for the ExoMarsTrace Gas Orbiter. ESA will provide one instrument as well as the spacecraft.NASA will provide the other four instruments, including the ExoMars ClimateSounder, which is being constructed at JPL. The2016 ExoMars Trace Gas Orbiter is the first in a series of collaborative Marsmissions between ESA and NASA. Avariable presence of small amounts of methane in the Martian atmosphere has been detected in orbital and Earth-basedobservations. A key goal of the mission is to gain a better understanding ofmethane and other trace gases that could be evidence of possible biologicalactivity. Methane can be produced biologically and in environments void oflife. TheExoMars Trace Gas Orbiter will also serve as a communications relay formissions on the surface of Mars. It will also carry a European-builtdescent-and-landing demonstration module that is designed to operate for only afew days on the Martian surface.